I have two columns [Lease] and [MOT] whereby I like to have a column displaying message "NOK" or "OK" to make the user act upon it. I now created two calculated columns [LeaseReminder] and [MOTReminder] with the following formula which basically shows -30 days earlier. 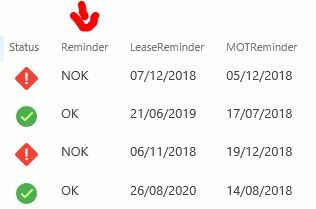 The "NOK" must be shown when one of the dates either [LeaseReminder] or [MOTReminder] is less than the Today() today's date. Otherwise, if both dates are bigger then today's date then show "OK" message. However, this does not work when both dates are less then today's dates or even when one of the dates is less than today! Seems your logic should be [LeaseReminder]>=TODAY() AND [MOTReminder]>=TODAY() then OK, else NOK according to your description. While there is a issue when use calculate column with TODAY(), that's calculate column won't update automatically. Try to use JSLink for this requirement. Calculated Column [Today] work around?